There are just as many bakeries in Tel Aviv as there are cafes. 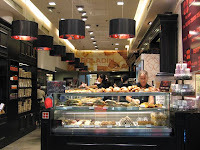 The leading chain of bakeries is Roladin and their pastries are considered to have the highest quality. 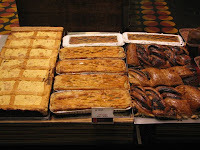 They are known for the savory pastries, like the quiches, but even more famous for their sweets - croissants, cakes, cookies and etc. If you hit one of the cafe-restaurant version, you can also take some cafe food, like salads, pasta or sandwiches. But more often you will find some strolling tourists in Tel Aviv stopping by to have a coffee and one of their special desserts. * Tip: If you are happen to be in Israel around Hanukkah holiday, don't dare to miss their Sufgania - traditional pastry for Hanukkah. Don't let the long line of people scare you either.